Let's face it. I'm a girl who loves me some DIY wall art. Remember my scrapbook Modge Podge city skyline art? My rustic pallet quote sign? The Instagram photo display I created? My painters tape abstract art? Or my nail head trim art? Yeah, the list could go on and on and on. Needless to say, when it came to decorating Little Lady June's walls, it didn't take me long to work up some do-it-yourself projects. 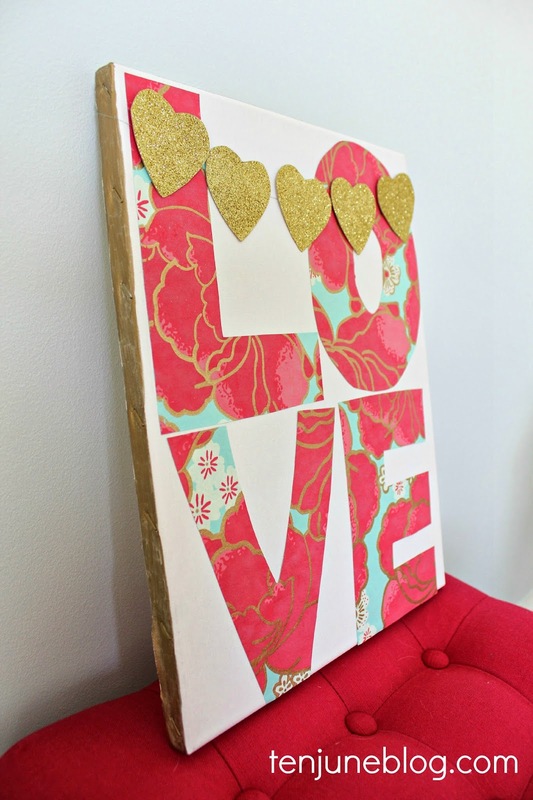 One of my favs that I made is this DIY nursery "love" art. 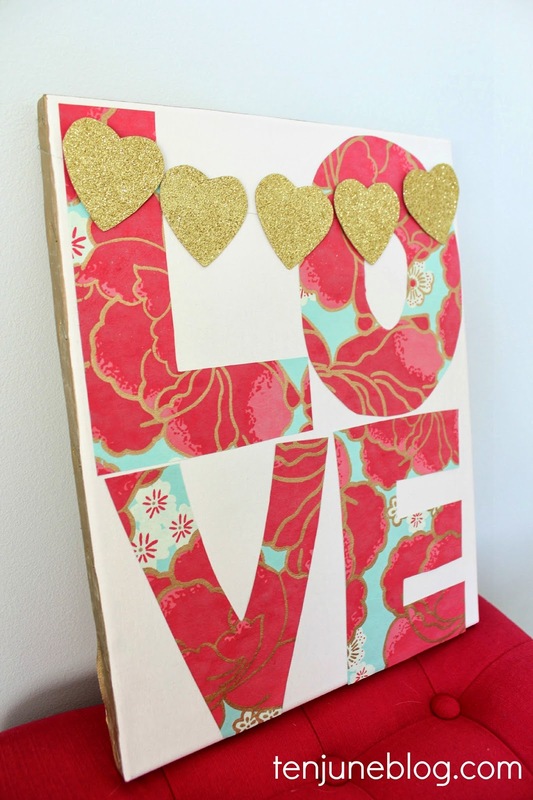 Supplies: canvas, scrapbook or wrapping paper, scissors, glue and a gold marker. From the beginning, I knew that this project needed to be a little glam. As you know, Little June's nursery (which I need to snap final pics of and share with you!) is pink and gold, so I had to add some Liberace flare to this piece. I simply used a gold Sharpie marker to color the edges of the canvas. 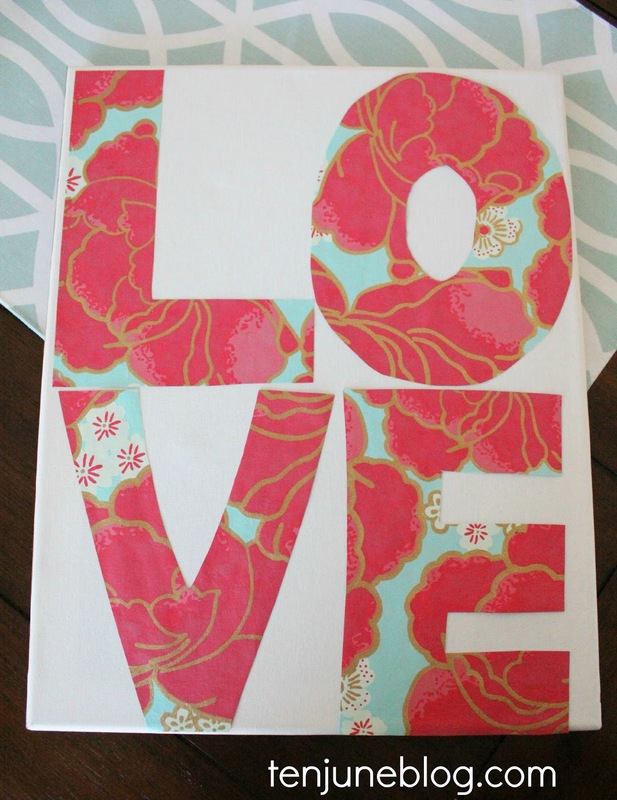 Next, I cut out the letters for L-O-V-E from some pretty wrapping paper I picked up at World Market years ago and then glued them onto the canvas. I wanted the letters to be large and close together, for sort of a modern look. I was really happy with the result, but thought the piece needed a little more pizazz. I first added a few gold dot stickers, but eventually decided that wasn't my favorite option. Instead, I decided to add a few pretty gold sparkling hearts. 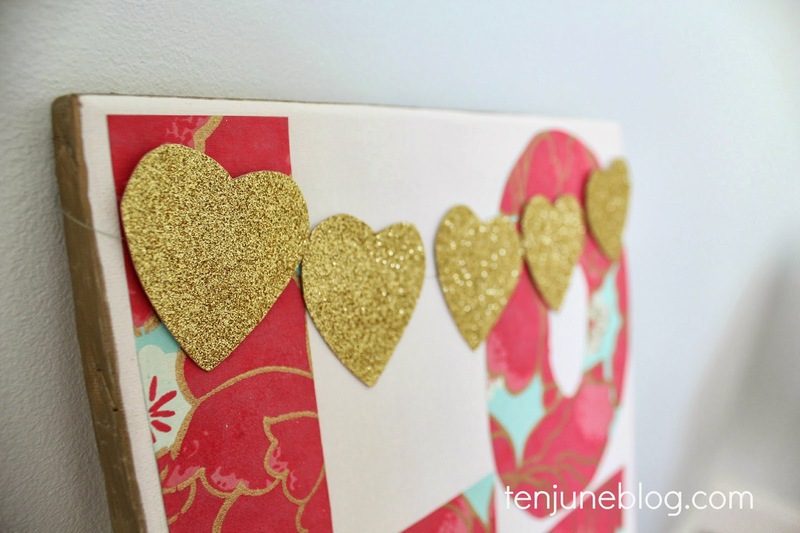 I used a heart-shaped cookie cutter to trace hearts on some gold glitter scrap book paper. Then I glued each heart to a piece of clear fishing wire and draped the wire across the art. 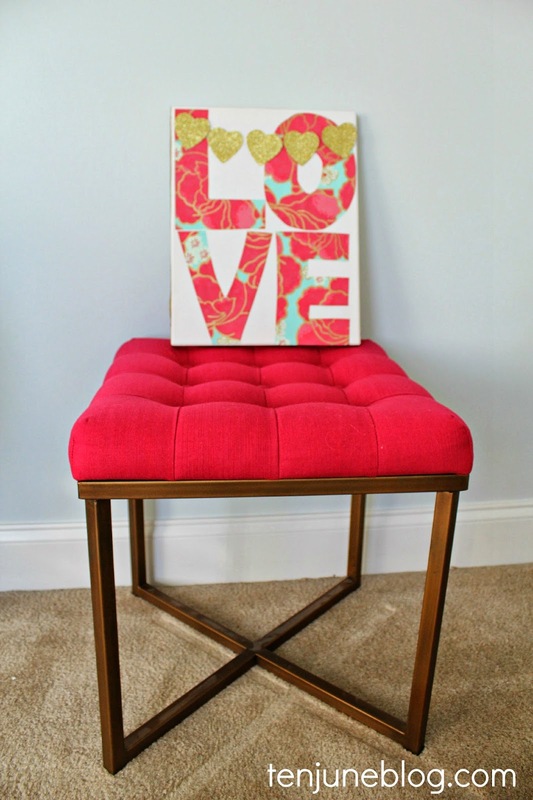 I pretty much love the end result of this super simple DIY. And hopefully LLJ will love it, too! super cute! love the paper you used! Very cute! The paper that you have from World Market is so beautiful! Such a cute idea my crafty friend! When do we get to see the whole nursery?! Dying over here! This is so cute! And super easy. I love that paper! You are so creative. I just adore that floral paper. Really really cute, my friend. Lovely crafting. I should made one for my sweet family. This is too cute! Love it. Stunning!!! So simple yet such a statement!!! Thanks for sharing! !